Day 10: In which Ottawa Magazine contributing editor Mark Bourrie dissects Tory attack ads, compliments two party leaders on their engaging personalities, and opines on pot laws. I could just see the attack ads the Tories could launch against me. Guilty again. Yup, it left me narcoleptic the first time. Second go-round was worse than the first. My apologies to any physicists out there, but dropping ice cubes into beakers of hot boiling water, then noting the fact that the water cooled down, seemed like a waste of time. But years later when I read about the workings of the uranium and plutonium atomic bombs, no one had to explain that twice. I often show my students how to make a simple gun-type Hiroshima bomb in a little two-minute lecture. All of a sudden, a class of bored 18-year-olds perks right up. Go figure. Sure have. Not for about 30 years, but I smoked lots of weed. May account for my trouble with physics. My friends will also remind me that I bought much less than I smoked. Coming from a family that was, in earlier generations, thick with alcoholics, I decided a long time ago that I preferred the company of potheads to drunks. I even wrote a book explaining how we turned a non-problem into a multi-billion-dollar trough for the police and prison industries and made drug dealers rich. How much of a non-problem was it? It was so unbad that Canadian officials banned pot in 1923, forgot they did it, and Parliament banned it again in 1937. That was the basis of my master’s thesis, which was published as the now-remaindered pro-pot tract, Hemp. Gosh. Judging by the tone of that ad, Michael Ignatieff is the 17-year-old parked in front of my house, honking his horn to get my teenage daughter to hurry up so he can drive her to a secluded alley and give her herpes. The narrator has the inflection of a man warning that a vote for the Liberals is a vote for some guy who lives in a rubber room, cutting pictures of ordinary Canadians out of Maclean’s magazine and eating them. 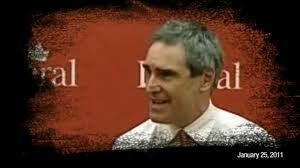 Michael Ignatieff does generate emotions in me. Fear is not one. Wonderment is. I have never seen such a smart man dumb himself down to the point where he talked like a teacher of an English as a Second Language course. Yes, we may be ordinary, Mike, but quit talking like you live in a commercial. (Both Harper and Ignatieff are much more engaging one-on-one. Get Harper fired up about cats, and he loses that 1,000-yard stare and actually becomes human. I have known many cat freaks, but no one knows cats as well as Stephen Harper. No one. I am left in wonderment, too, about the negativity of the Tory campaign. Usually, a leader with a big lead builds a bandwagon for people to jump on. Everyone loves to back a winner, especially one whose party actually looks like a party. You get out the bands, you say nice things, you build a tent big enough for everyone to come into. That’s why this election is so strange. The guy who’s supposed to be way ahead seems angry, frightened, and desperate. The guy who is supposed to be four weeks from political oblivion is smiling, rather positive, and not the least bit cranky. I’m not sure why. Maybe the Tories have spent so many years losing that they don’t know how to win. Certainly, victimhood — by the “leftist” media, Quebeckers, educated folks, yuppies, Easterners, and the lot — has been the psychic anchor of the sullen Alberta neo-cons since the Preston Manning Medicine Show rolled into town in 1993. Or maybe they’re tapping into a new ugliness among the Canadian people. If so, maybe all those years of reading cats has paid off for Stephen Harper.